Should I Put EQ Before or After Compression? This week article comes form a question I received last week from one of my students. Actually this question has been asked of me several times in the past so let’s answer it here shall we? The question is this. Well, it depends. 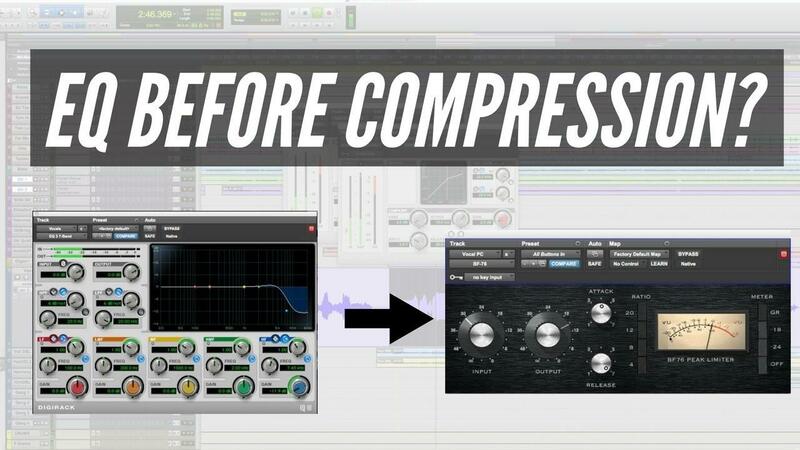 When I think about compression I think about controlling the dynamic range of a track and gluing it together. Simply put, we are going to lower the volume of the “peaks” in the audio and raise the volume of the “dips” in audio. Once we do that we are going to raise the overall volume of the track to make up for the compression we added. Now, interesting enough the way our ears hear things we perceive compression as making the audio louder and turning up the softer audio parts as opposed to softening the louder parts of the audio. If I have to do a lot of EQ boosting to a track, say add 10db at 12Khz to an acoustic guitar to give it some air, then I would do that AFTER the compressor. Why? Because with that type of drastic boost placed before the compressor, it will change the way to compressor responds and the compressor will turn down that boost, as that is what a compressor does right? So if I am doing a lot of boosting then I typically will put the EQ AFTER the compressor. On the other hand, if I have a 60hz rumble on that same acoustic guitar that I want to get rid of I would put the EQ BEFORE the compressor to eliminate that rumble before the compressor turns up that audio and makes it more obvious to the ears. Make sense? The bottom line is that you need to experiment and see what works for your particular situation. Remember, there is no “right” way or “only” way to do anything in mixing. There are a bunch of guidelines to follow but ultimately whatever makes the track sound good to your ears is what matters. Get 5 of my Quick Mix Training courses absolutely FREE. Click button below and go back to our home page. You will see this offer right at the top of the page. How Valuable is Customer Service & Why is That?